As we're traveling, I never know if I'll find something yellow for the day. That's the fun of it. Today, we're staying at a lovely home with a sweet couple. 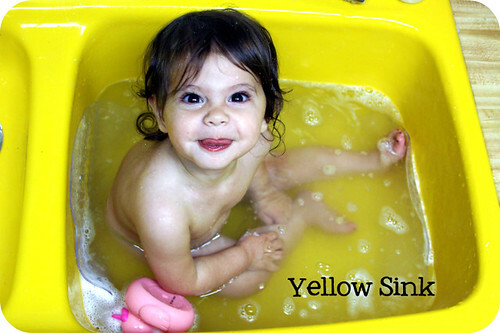 And guess what...they have a perfectly YELLOW sink! We knew exactly where Josefine was going to get her bath for the evening! We've never bathed her in a sink...not even when she was itty-bitty. Her first experience was such fun! She splashed and laughed and made the biggest, wettest (is that a word?) mess ever! And of course, she was playing Silly Billy most of the time...hence, this adorable expression! NOTE: We will be at camp all week, and it's not likely that I'll be able to post, though I hope to get a daily photo for the project! I'll be back on Saturday!